If I have to mention one thing that’s currently trending in Jakarta, it’s bazaar. Don’t think about the big Jakarta Fair or something like the ones held at Balai Kartini (JakToys Fair or Mother & Baby Fair perhaps?). Think of them on a smaller scale held at a limited space inside or by a prestigious shopping mall. But this time, the one we’re attending, Jungle Fever, is a bazaar organized by All Access Jakarta which was held at Marketing Gallery Pantai Indah Kapuk. So going inside, we're more interested on the food than on the fashion. Bazaar food and beverages are more about a competition of unique concepts. So if you happen to be in a mall and find a row of food stalls, browse them at least once and see if there's anything worth to try. In this bazaar we found Harvest Moo, a pasteurized milk served in a glass bottle which comes in your favorite flavors: Red Velvet, Strawberry Cheesecake and Vanilla Cream. The girl behind the booth said that they have a cafe down at the Summareccon Digital Center. Maybe sometimes we have to stop by. Food-wise, we met again with the Ppoki Bang, the poop bread (which booth is next door to Harvest Moo). We also tried Potato Ball. You can easily guess what's the food is like. In Indonesia, we have this Holland-adopted snack called kroket which is pretty much the same with potato ball except that potato balls are smaller in size and are filled with cheese and sausage instead of ground beef. Potato Balls also offer different kind of toppings: Mayo, Ketchup, BBQ or Chilli. But knowing Andrew, he ordered plain. Usually, bazaar is about food and drinks. 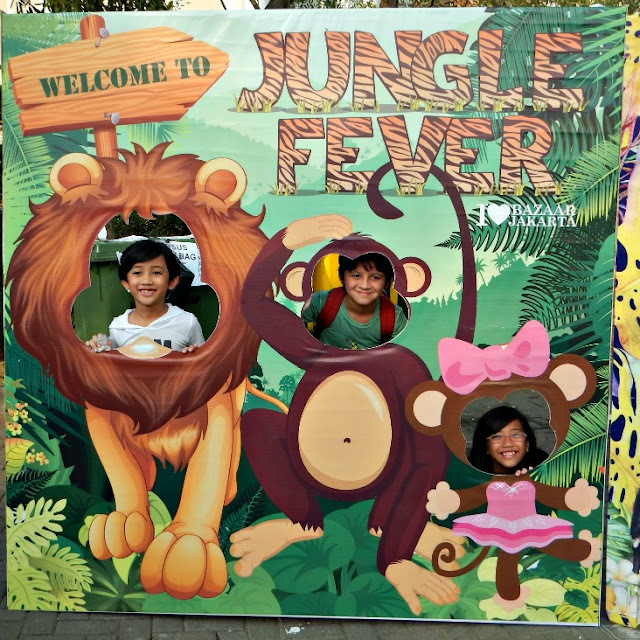 While Andrew is curious with the food, this one has additional attraction that would definitely keep the kids busy: animals. A mini petting zoo is opened right next to the food and beverages tent. There you can find different animals from the orninary (but puffy) rabbits to the exotic sugar glider that would raised questions from Andrew. From the cute Guinea Pigs to the disgusting snakes and lizards. We had a little disagreement over that because I found snakes cute too and Andrew is totally against it. Well, if you're starting to fed up with the malls, try to find what kind of bazaar is held inside or look for one build outside the shopping centers for a change. You might find delicious food, interesting drinks and a little surprise on the side.